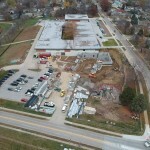 Rough in and finish work continues at the new Swanson Elementary in both the classroom wing and in the administration area. Crews are currently installing millwork in the classrooms while painting, and door installation is progressing throughout the building. Gym equipment has now been installed, and crews are currently focusing on kitchen tile and equipment. Site work is also underway, and Vrana Construction is currently installing retaining walls along the north side of the building. We are still on time for a project opening to students in the Fall of 2019! Contract documents for the extensive renovation and additions at Prairie Lane are being finalized and sent to city officials for review. Vrana Construction has been selected as the CMR (Construction Manager at Risk), and construction is set to begin in June of 2019. All are invited to a Community Information session on April 2, 2019 at 6:30pm at Prairie Lane, to showcase design development drawings approved by the Westside Board of Education. Crews used Spring Break to kick off construction on an expanded welding lab at Westside High School. The Westside High School Engineering Lab will allow more curriculum with state of the art equipment, making Westside a premiere program for workforce development and trades training. Our sincere thanks to the Westside Foundation and generous donors for funding this project, expected to be complete for the 2019-2020 school year! Crews continue exterior brick work at the new Westside Boys & Girls Club at Westbrook Elementary, while interior metal framing and block work continues. Rough in work is also ongoing, as is roofing installation. Crews will install exterior window frames within a few weeks. Interior slab on grade work also continues This project, funded by the Boys & Girls Club of the Midlands, is scheduled to open to students in the Fall of 2019.